I want to make you sound like a true celebrity! Not that you’re not, it’s just that sometimes when you write a boring bio and someone reads it from stage, you sound sort of boring. 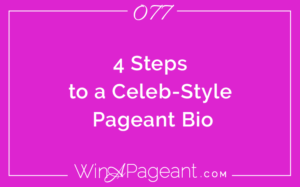 In this episode, I’m going to teach you how to write an epic pageant bio that makes you sound like the celeb you are! Step 1 – Write a list of all the things that make you awesome. Think of awards, titles, positions you’ve held. This could be that you are the Brand Ambassador for an organization or the secretary of the National Honor’s Society. Or, you could talk about how you wrote a book, created an app, designed a t-shirt, raised money, or founded a student club. Write out the main point in bullet points (not full sentences, yet). Step 2 – Put the bullet points in order of how awesome they sound to others. I mean it if someone read them out in one of those announcer voices, which one is the coolest? Get what I mean? When you say it in an announcer voice, the silly things sound silly and the cool stuff sounds really cool! That’s what will help you determine the difference. So put them in order of greatness with the top one being the greatest. Step 3 – Write one sentence for every bullet point with the focus on the actual accomplishment. For example, if you created a blog don’t write your sentence like this She created a blog called Rockin’ Fashion. Say She’s the creator of the online fashion resource for women called Rockin’ Fashion. See what I did there? Make it fancy! Step 4 – Go back through each of your sentences and give them a different starting phrase to make them sounds unique and avoid redundancy. You don’t want every sentence to start with She is the… Instead, try rewriting the sentence starting with Her…’ and As the… to describe your accomplishments. I want to share with you an actual bio of one of my clients, Rita. Rita is a rockstar and she wrote her own bio the first time. Then, I wrote her bio and showcased her actual rockstar-isms and it made a world of difference for her press kit! Born in Japan, to a military father and native Japanese mother, Rita was always told that she should use her strengths to help others. As someone who was very interested in technology and entrepreneurship early on in life, she loved empowering others by helping people learn about technology and entrepreneurship. Scammed in high school when trying to create an app, and want to use knowledge and skillset to help others with their goals. Rita Roloff is a national Ambassador for Pretty Brainy and founder of StilletosToStem.com, where she inspires women to learn technology. She’s a tech expert who’s seen and tried it all from app development to fashion-tech design. You can find her online doing regular Facebook Live videos about the latest in tech. Rita is currently studying tech entrepreneurship at UW-Madison. A few key take-aways from this example are that we focused on the most important aspects and left out the details. We also only used words with positive connotation. Help your audience, judges, and fans see your best aspects and leave them with a positive, uplifted feeling. Today, I’m saving you from the ‘deer in the headlights’ look. I know you’ve seen it before. It’s so super awkward for your whole audience and the poor girl usually doesn’t even know it’s happening until she gets the photos back and she blames the photographer for catching her at a bad moment…until she gets the DVD and realizes she had no good moment. 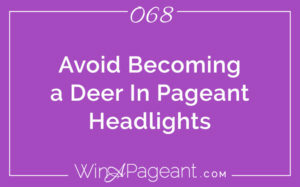 The ‘deer in the headlights’ phrase describes the pageant girl that walks onto stage and nearly freezes like a deer that steps out onto the road and freezes looking right at it until it’s hit at full speed. It’s awful. For everyone. But especially for the woman that doesn’t even realize she’s doing it. 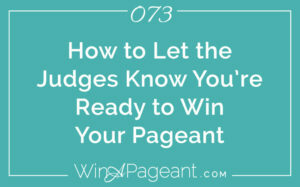 One of my lovely VIP clients recently asked me for advice about answering the final question in the pageant. This is the question that makes women the most nervous because in most pageants it separates the winner from the others in the top 5. When she asked me, I realized that she was probably looking for sometime about taking deep breathes or studying all sorts of questions until you know everything under the sun. I think my answer surprised her at first (although, we’ve been working together for several months, so she’s used to me solving the root of the problem rather than handing her a bandaid). In today’s episode, I’m going to share with you the advice I gave her my top three tips for answering the final question at your pageant. I’ve done several training episodes on the specifics of answering your on-stage question, which I suggest you take a listen to as well. So, today’s episode is going to look at the final question with a more holistic approach.